With this sheet comes a copy, in advance of issue, of The Ideology Of A Monument. I intend to bring this to the notice of Robert Barltrop (author of The Monument) and of the SPGB. If it does not produce a reaction I shall have failed in my provocative purpose. This being so, I am concerned, even more than with most things issued, to ensure that it is free of the horrible clangers which can remain unnoticed until too late. Your criticism is requested. It is “presented to,” not issued by, the WS (and the SPGB). No organisation is responsible for anything presented to it, so you are not being asked to share responsibility, only to be critical. (And the WS has no members, anyway). I shall welcome your indication of things I’ve got wrong, or have failed to express clearly, or which would be better omitted. The problem has been one of exclusion; I shan’t be able to welcome suggestions for additional things to include. If you have other things you think should be said, well, there is no reason why I, and Pete in his review for New Society, should be the only ones to issue anything on the subject. To spare you the trouble of a negative reply, if I have not heard from you by 4th March (letter please, phone calls too likely to be misunderstood), I shall take it you have no comment to make. A commentary on: The Monument / The Story of the Socialist Party of Great Britain, by Robert Barltrop (With some ideological remarks on the SPGB). 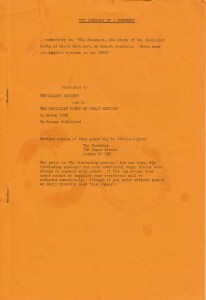 Published by Pluto Press, [Address], 1975. Paperback, 200 pages. Presented to The Walsby Society and to The Socialist Party Of Great Britain in March 1976 by George W. Walford. Further copies of this paper may be obtained from: The Bookshop [Address]. The price is 13p (including postage) for one copy, 6 1/2p (including postage) for each additional copy. Please send stamps or payment with order. If for any reason your order cannot be supplied your remittance will be refunded immediately. (Though if you order without payment we shall probably send them anyway). The Monument is richly informative. It is brisk, lucid and entertaining. It is detached without being condescending. It is the best presentation of the SPGB, its principles, its policy, its personalities and its history, in their living roundness, which has yet appeared. It establishes, sympathetically and with a wealth of detail, the impression I have always had of the Party: its heroic singlemindedness. I recommend it to anybody seeking a book which will adequately introduce the Party to an enquirer. I do not expect the SPGB to agree with me. The Monument is not perfect. There are errors of fact, some of them serious, but these can be corrected in a later edition without affecting the main body of the work. My own special knowledge concerns the account given, on pages 149-150, of Harold Walsby and the Social Science Association. This falls below the level of accuracy which, as far as my knowledge goes, is maintained, by the remainder of the book. I was out of London at the time of the events described in the sentence beginning “The SSA hired a hall…” on page 150, and cannot speak of them from direct knowledge. I know of them from report, at the time and afterward, and I believe the account given in The Monument to be a distortion. I know Robert Barltrop is wrong in saying the SSA did these things. It could not have done them. It was not in existence at the time. It was not founded until October 1944. Where Harold Walsby, his work and the SSA are concerned, Robert Barltrop is so badly wrong on so many things of which I have direct knowledge, and sometimes conclusive evidence (see below), that I am compelled to disregard, and advise the reader to disregard, everything he says on these subjects. I was in close touch with the SSA from the time it was first suggested until shortly before it was wound up; I was Secretary for most of its active existence. Its meetings were of three types, all of them used by the SPGB. Private gatherings in the homes of members and supporters, fund-raising socials, lectures followed by questions arid discussion. Not one of them was as “theatrical” as one SPGB meeting I attended at Conway Hall, where (dare I say it?) the front of the gallery was hung with posters! To support wherever possible the extension, development and application of scientific method to contemporary social and political problems. The SSA therefore aims at advancing human understanding of human nature as the prerequisite of a rational, peaceful and scientific control of human society. “Astonishingly,” and “strangeness,” and “wonder” are appropriate terms here; the SSA, was wound up on 18th January 1956 – years before these events took place. I cannot claim that this constitutes a complete rebuttal of the charge made. It is not possible to rebut effectively the charge that one’s influence was in the background, not even by proving one had died years earlier. Fortunately, the vagueness which makes the charge difficult to rebut also makes it unimportant. Its only effect is to raise the question: Who is obsessed? Is it the SSA or the man who worries about its influence years after it is dead? Harold Walsby was not a member of the SPGB during the ‘Thirties. He did not place Conservatism “at the bottom” of the “pyramid” of “political outlooks”; neither did he regard Conservatism (or any ideology) as “crass.” For what he did say on these subjects the reader is referred to pages 213-217 of The Domain of Ideologies. In half a lifetime of close association with Harold Walsby and his work, I have heard his theories described in many different ways. Never, until reading The Monument, have I seen or heard them described as “simple.” My first reaction to this was that Robert Barltrop might be willing to help some of those now struggling with The Domain of Ideologies. After re-reading his remarks about Conservatism, and comparing them with what Walsby did say on this subject, I decided it would be better not. This is an instance of something familiar to most of us: the theory which appears simple until we begin to understand it. Harold Walsby died in 1973. His ideas, are alive, and well, and provided with defenders. In his statements about Harold Walsby, his work, and the Social Science Association, Mr. Barltrop does not display the concern for accuracy required of an author who wishes his work to be taken seriously. On these subjects so much of the information he offers is, as I have shown above, inaccurate, or misleading, or contrary to the record, that all of it is be distrusted and is best disregarded. The Monument is a history of the SPGB, not of the SSA. The matters to which I have drawn attention, although serious, do not greatly detract from the success with which it fluffiness its main purpose I hope for a second, corrected, edition. In the meantime I shall, when recommending it, draw attention to these errors? The Monument does not alter my view of the SPGB (I realise this is one reason I think well of the book). The information it gives confirms the opinion which I, following Harold Walsby, have held since I lapsed (or resigned, or was expelled – I forget which) in the early ‘Forties. This is, to put the essence of it into one sentence, that the Party does perform a function but not the one it believes and declares itself to be performing. The SPGB does not work in order to establish Socialism, and it does not work in order to spread Socialist understanding. If we were to believe that the SPGB aimed to achieve these things, then we would have to believe that most of its seventy years of effort have been wasted. We would also have to believe that its behaviour is not rational. To continue with a course of action which over nearly seventy years has produced no effective result is not a rational act. The behaviour of the SPGB can only be understood as rational when we recognise that to the SPGB success or failure, progress or regression, victory or defeat, are alike irrelevant. These things are irrelevant because the object of the SPGB is not the establishment of Socialism or the spread of Socialist understanding. The object of the SPGB is the maintenance of opposition. It opposes, and struggles, and rebels, for the sake of the ideological satisfaction derived from opposition and struggle and rebellion. When it is recognised that the Party seeks not Socialism but opposition, then its behaviour is seen as fully rational. Its course of action to date has provided opposition in plenty, so that to continue in the same way is only good sense. Note that “solely” – he agrees the Party was not in the fray for the purpose of promoting Socialism. At the time this book was published he was, so far as appears in it, a member, having rejoined-in 1969. He writes the above sentence with Socialist understanding. If the name of the Party is to refer to its object, then the SPGB should become the OPGB: The Oppositionist Party of Great Britain. Throughout the seventy years of the Party’s existence, and through all the changing conditions of those years, the result of its work has been consistent. Of all those it has contacted, by indoor or outdoor meetings, by members personally, or through its literature, those who have accepted the Socialist message have been a small minority. According to Barltrop its membership has varied between about four hundred and about one thousand, and when his book was completed it was below the highest point, reached. The conclusion is inescapable that to the overwhelming majority of the working class (in Britain alone it numbers millions) the Socialist message is meaningless, and will remain so. There is now, as there was in 1904 when the SPGB was founded, a tiny minority ideologically predisposed toward argument and opposition, toward hostility and conflict in political matters, toward a connection with the SPGB. In anyone area, whether it be a town, a country or the world, when these potential members have been “collected,” then in that area the Socialist movement can grow no farther. This is confirmed by the history of the Party and of its sister parties abroad. An attempt to establish a branch in a “new” area usually succeeds, but the branch reaches a certain size (rarely, except in the biggest towns, getting above double figures), and after that no amount of effort enlarges the branch any farther. The exploitation of which the SPGB speaks is real. The dangers of which it speaks are real. The futility it ascribes to the other parties is real. What is not real is the claim of the SPGB to be working to end these things. It is not concerned to end these things. It is concerned to satisfy the ideological need of its own members to engage in struggle and opposition. The SPGB claims to demonstrate that all other parties are doing not what they claim to be doing but something different. They are, it claims to show, not improving the conditions of the workers, or promoting democracy, or equality, or Socialism, but defending Capitalism. The SPGB is also is doing something different from what it claims to be doing. It is not working for the establishment of Socialism. It is working to ensure that its members enjoy the satisfactions of rebellion and opposition and hostility. In doing this, in helping to direct their attention and their energies away from the problems and the dangers, with which society confronts us all, toward their own ideological requirements, the SPGB also is helping to defend Capitalism. 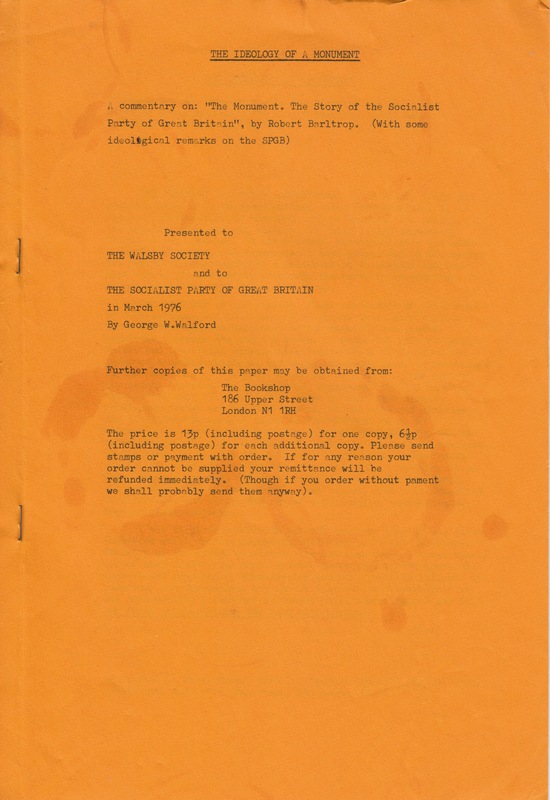 Any members of the SPGB (or others) who may wish to enquire further into the ideological explanation of the SPGB (and of much else besides) are invited to contact the writer (by writing to the address from which this paper is issued) or the Walsby Society. I can assure them, whatever Robert Barltrop may say, that the propositions they will meet have little that is “simple” about them.